Q. How do I update Firefox on my computer? Open a new window of Mozilla Firefox on your computer. 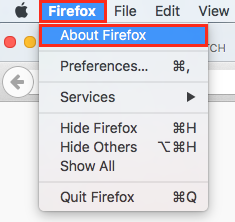 Open About Firefox from the Firefox Menu. Firefox will open an information window and check for updates. If Firefox is up to date it will now say so, otherwise you will be prompted to Install a newer version. If your version is lower than Version 44.0.2 and the window says "Firefox is up to date" please take a Screenshot (How do I take a screenshot on a Mac?) and Email it to 1degree@scotch.wa.edu.au or 1degree@plc.wa.edu.au explaining that your Firefox is unable to update.